The other evening, Peter and Rene treated us to a night out as an early Christmas present. Cirque du Soleil had a touring show in town, so we went to see it. For old fuddy duddies who have never gone to one of these productions, it was quite a treat. It is still hard to believe that humans can do all of the things that they do in such a spectacular event. Before the show, we went to dinner at the Old Clam House, reportedly the oldest still-operational restaurant in San Francisco. That is not hard to believe. It sits on a grimy thoroughfare in the middle of an industrial area that was once on the wharves of San Francisco. 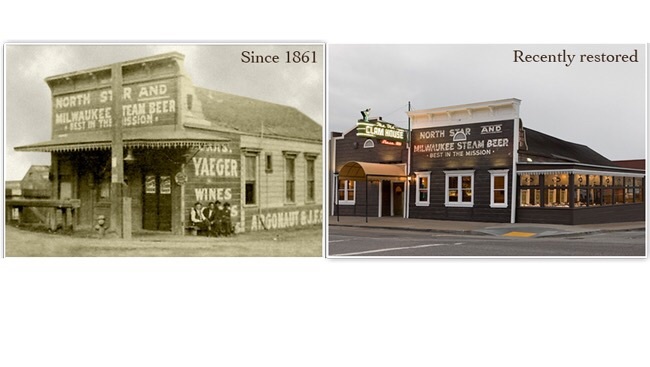 The restaurant had its start in 1861, as the first wave of the Gold Rush was winding down. The place is an old clapboard building with a peaked roof. It is now painted, but it apparently spent many of its days as a raw wood establishment similar to those you see in old western movies. Inside, the original embossed tin ceiling is preserved, and the bar is a huge mirrored, ornately carved wooden structure that is at least twenty feet high. I was prepared for the food to be ordinary and tourist-driven, much like that at Fisherman’s Wharf, but I was wrong. Tourists probably don’t get there much, and the customers all looked like they were regulars, especially those sitting at the bar. As soon as we sat down at the table covered with a blue-checked tablecloth, the waitress brought us a round of warm clam broth served in little glass cups along with a big loaf of Acme bread. That gave us a chance to study the menu. The menu is fairly long and largely restricted to seafood, especially shell-fish. There is a nod to some California specialties like sand dabs, and because the season for Dungeness crabs has just opened there are several crab dishes. Susan ordered clam chowder – she always does, even at the Grand Central Oyster Bar in New York. Rene ordered crab cakes, and Peter ordered a whole crab, thus requiring the obligate bib. I ordered the cioppino because, after all, this is San Francisco and it occupied a prominent place on the menu. With a wink, the waitress assured me that this was the original version of the dish. I’m certain that is not true, but I am equally certain that this version is delicious and enough for a longshoreman, if there is such a person around the place anymore. The bowl was a cast iron pot, piping hot and filled with a tomatoey broth rich with crab, clams, shrimp, mussels, and calamari along with new potatoes and chunks of corn on the cob. One local food critic claims the soup is diluted bottled marinara and the clam broth is mostly chicken stock. I don’t believe either of those assertions, but I don’t have the cultivated palate of a food critic. Here is a recipe for cioppino that has been in our family for nearly 40 years. It was given to us by our friend, Nancy Swanson, who prepared it for a group of couples with the ski patrol in Park City. Of course, there are many versions of cioppino. I am certain the food critic would declare this one not to be authentic, but if it tastes good, why worry about authenticity? Drain the clams, reserving 1/4 cup clam juice. Add the remaining clam juice to the sautéed mixture. Add the tomatoes, tomato paste, wine, herbs, salt, pepper, and fish stock. Bring to the boil and simmer 10 minutes. Cut the fish into bite-sized pieces. Add the clams, fish and shrimp to the soup and simmer, covered, for 35 minutes. Remove cover and simmer for 15 more minutes. Serve with good San Francisco style bread. I agree with you about authenticity…flavor is what it is all about. If this recipe has been shared for all these years, it has to be delicious. Thanks, Karen. I get so frustrated with Yelp comments that complain that a particular dish is not “authentic” The issue is, does it taste good? Having worked at The Old Clamhouse for 6 years (1980s) so I can truthfully testify the current version is not the one I served to 100’s of satisfied diners. Ne’er a potato or corn in the huge stainless steel bowls we presented. Yes, I have tried the Cioppino, it’s good, but you know how nostalgia and affection can prejudice the palate? Well, that’s my perspective. I do look forward to testing your recipe! Thanks for your insights about the Old Clam House and ciopinno. I hope you enjoy my version. I did enjoy your version very much! Alas sans the crusty sourdough because I currently reside in Hawaii and even starter I brought from SF morphed due to humidity. The Hawaiians would say your recipe is “Ono” (delicious). In Pidgeon slang my Hawaiian neighbor declared “It broke da mouf”. Trust me that is high praise indeed. Delightful sauce that enhanced and didn’t overwhelm, I’ll use your recipe again. Mahalo for sharing. Glad you enjoyed the recipe, and thanks for your nice comments.